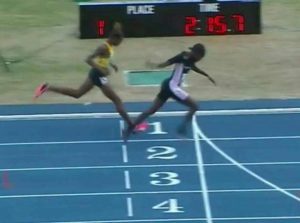 St. Kitts and Nevis won its first gold medal at the 2018 Flow CARIFTA games after one of the youngest athletes at the games, Trishanni Warner, 14, captured the U17 Girls 800m final. Warner is a second form student of the Charles E Mills Secondary School and won the race in 2:15.73 seconds, stunning the field of athletes and spectators in the Bahamas. According to a statment from the SKNAAA, Warner’s performance at the just-concluded TDC-sponsored Interschool Championships gave selectors satisfaction that she would be competitive at the CARIFTA level. “She’s now the youngest athlete from the federation to secure a CARIFTA medal,” the SKNAAA exclaimed.